Ships free! Shop owner? Hoarder? Stinky? Order in bulk and save! Receive 20% off when you order 24 or more candles. The vintage soda pop cans usually sell for $20 each. You would be paying $15 each if you order 24 or more. This group pictured is not for sale. This is just an example of a bulk order. All cans are vintage steel cans, so they do not get overly hot when you burn the candle. Each can will fill your room with scent for over 35 hours! You can choose an assortment of scents or I can give you a variety. Please message me to find out my current turn around time. 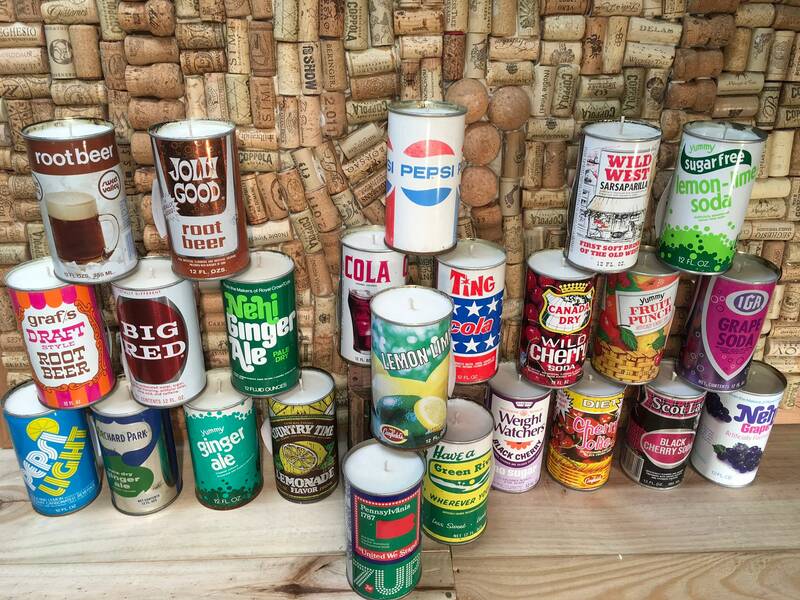 I can send you photos of vintage can assortments before you buy. Thank you! We use 100% natural premium US non GMO soy wax in our candles. Our fragrances are phthalate free. Our wicks are 100% cotton self trimming so there is no nasty additives and no need to trim the wicks. We also offer hand delivery here in Chicago!